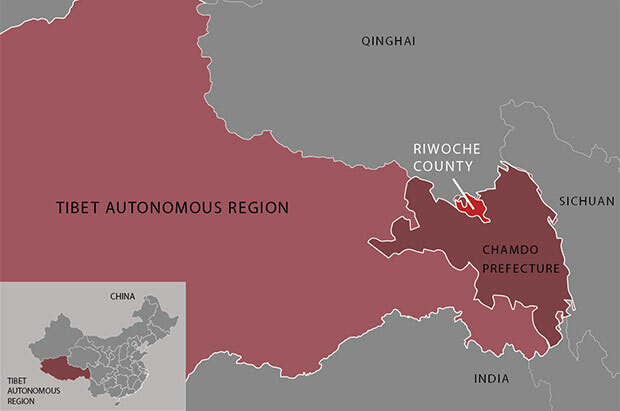 (TibetanReview.net, Jul09, 2016) – Officials in Riwoche (Chinese: Leiwuqi) County of Chamdo (Changdu) Prefecture, Tibet Autonomous Region, are forcibly confiscating Tibetan land at a pittance and reselling them to Chinese developers for huge profits, reported RFA.org Jul 7, citing a local resident. The report added that those refusing to sell their land were being threatened with imprisonment. The officials were said to claim that the land belonged to the local government in conjunction with the ruling Chinese Communist Party. The official were said to provide the hapless Tibetans a measly compensation of 25 yuan (US$3.74) per square metre of land. The same piece of land was said to be easily worth 1,500 to 2,000 yuan (US$224.57 to 299.42), which means that the Tibetans were being offered something like only 1.5 percent of the market value of the land. The Chinese developers were then said to offer apartments newly built by them on the confiscated land back to Tibetans at high prices. Local officials were reported to have announced the planned confiscation of the Tibetan land at a public meeting in May when most of the people had gone to the mountains to collect cordyceps, a prized medicinal herb which is major source of livelihood for many poor Tibetans, during the annual hunting season for it. At that meeting, the Tibetans were reported to have been warned with imprisonment for anyone refusing the extortionate official deal, or anyone who may go to Beijing to plead their case with central government authorities.